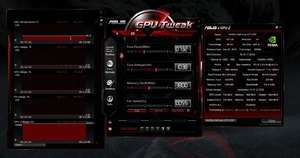 ASUS GPU Tweak Utility is a free application developed by ASUS which allows you to tweak and overclock your graphics cards. It supports NVIDIA and AMD adapters. It's interesting to note that you aren't required to have an ASUS board installed in your PC in order to take advantage of GPU Tweak Utility. GPU Tweak Utility provides a sleek interface in which you can control the clock speed of your graphics card, its GPU, fan and installed memory. Version 2.8.3.0 is a freeware program which does not have restrictions and it's free so it doesn't cost anything. For security reasons, you should also check out the ASUS GPU Tweak download at LO4D.com which includes virus and malware tests. Additional screenshots of this application download may be available, too.